Everyone likes a challenge right? Well not always sometimes they are downright scary! The challenge for round 2 of the Stampers Quest Search for the Trail Master was to make a Scene. Hey I can make a "scene" but I don't think it was the type of "scene" they were talking about! BTW you can still vote - go here! 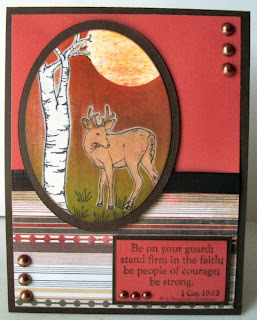 I was thankful that I had branched out a bit in the sets I have recently picked from FireCracker Designs by Pamela. She has some awesome things to make a scene with and all of the sets can mix and match to get what you want. Sometimes though that is the problem figuring out what you want! I tried to make a nice background and then figured I could stamp or layer up on it, wasn't working! I tried to make the scene first and then mask and brayer over for the background - not exactly what I had imagined! I finally ended up with this which I was kinda ok with but not too keen on the sun. See I liked my pearls too much to leave them totally off but I did remove them from vertical to horizontal so they matched. I also added a clippo and a piece of coordinating ribbon to the upper right of the card. Moved my sentiment up a tad higher too (and yeah when I went to remove things I had to swap out the patterned paper piece cause I ripped the other one!) So what do you think? Changes for the good? Changes too much? Changes not enough? 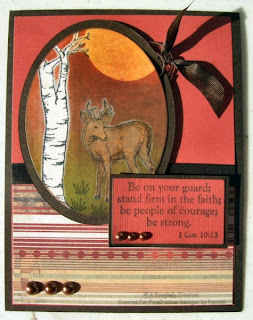 I ended up NOT choosing this one for the contest because in the adding to the sun color I thought the deer ended up mottled looking and just wasn't the best of the 2 cards I had then. P.S. Don't forget the DT call going on right now! FCD DT Call ends TODAY! Labels: Basic Grey, Bits-n-Pieces, Copic Markers, FireCracker Designs by Pamela, Nestabilities, Queen and Co.